Follow space shuttle Discovery's STS-119 mission to deliver the final power module to the international space station. Reload for the latest updates. The Discovery astronauts spent a busy day inspecting the shuttle's heat shield and preparing for the upcoming mission at the space station. The voluminous inspection data has been downlinked to engineers on the ground for analysis to determine if any follow-up checks will be required during time set aside on Flight Day 5. Late today, the crew extended the docking ring that connects to the port on the space station. They also set up the centerline camera to be used in the final approach. Other work accomplished included readying the spacewalking suits and staging equipment to be transferred during the station visit. Wakeup time on Tuesday -- docking day -- is 9:43 a.m. EDT. Mission Control just informed the station commander Mike Fincke that a maneuver to avoid a piece of space junk won't be required tonight after all. Further analysis shows the station and object won't get close enough to worry about a potential collision. The crew just finished the nose checks, staying right on the timeline for today. The left wing inspections are next up in this multi-hour job to survey the shuttle to look for any signs of launch damage. The precautionary safety inspection has become a standard activity for all post-Columbia shuttle crews. LeRoy Cain, chairman of the Mission Management Team in Houston, said in a news conference a short time ago that no areas of concern have stood out so far. After completing the starboard wing survey, the crew is positioning the inspection boom to get a closeup look on the shuttle's nose cap. Inspections of space shuttle Discovery have gotten underway with scans of the starboard wing. The shuttle's robot arm has grappled the Orbiter Boom Sensor System (OBSS) and is lifting it out of the payload bay as the crew prepares to inspect Discovery's thermal protection system for signs of launch damage. Discovery's astronauts are preparing to unberth a 50-foot long instrumented boom that will be used to inspect the orbiter's thermal protection system today. The crew of Discovery just completed the 15-second NC-2 rendezvous rocket firing to keep them on course for tomorrow's docking with the international space station. Mission Control informed the crew it was a good burn. Read our morning story here. Mission Control has awakened the astronauts with the song "Free Bird" by Lynyrd Skynyrd to begin Flight Day 2, the crew's first full day in orbit. Following last night's launch, the astronauts opened the payload bay doors, deployed the high-speed communications antenna and turned their spaceship from a rocket into an orbiting spacecraft. After a late meal, they went to bed for an 8-hour sleep period. Our launch story has been updated. The official liftoff time was 7:43:44.074 p.m. EDT. Initial examination of video and film taken of the launch is getting underway. "So far, there are no observations indicating any concern for the vehicle or success of the mission," CAPCOM George Zamka just radioed the shuttle crew from Mission Control. Both 60-foot-long payload bay doors of shuttle Discovery were opened a few minutes ago. Mission Control gave the astronauts a "go" for on-orbit operations at 9:21 p.m. EDT following today's journey to space. Running a month behind schedule and facing a Tuesday deadline, the shuttle Discovery finally roared to life and thundered into orbit late today, putting on a dramatic show as it rocketed out of dusk and into sunlight atop a torrent of fire from its twin solid-fuel boosters. T+plus 64 minutes. "Everything is looking really good on the orbiter," Mission Management Team chairman Mike Moses says. T+plus 39 minutes, 50 seconds. The twin Orbital Maneuvering System engines on the tail of Discovery have been fired successfully to propel the shuttle the rest of the way to orbit. The new orbit is targeted to have a high point of 142 miles and low point of 98 miles. Discovery is en route to the international spce station on a mission to deliver and activate the Starboard 6 solar array truss that will bring the outpost to full power. The $300 million payload is a 15.5-ton girder will be connected to the station's backbone by spacewalking astronauts during the flight. In addition, the shuttle is carrying Koichi Wakata to become the first Japanese astronaut to serve as a long-duration resident crew member aboard the station, replacing Sandy Magnus as an Expedition flight engineer. Magnus will return to Earth on Discovery after four months living on the station. T+plus 38 minutes, 45 seconds. The maneuvering engines are burning ignited for the orbit raising burn that also refines the path to the space station. T+plus 37 minutes. Discovery in the proper orientation for the upcoming maneuvering burn. T+plus 27 minutes. The two flapper doors on the belly of Discovery are being swung closed to shield the umbilicals that had connected to the external fuel tank. T+plus 15 minutes. The three Auxiliary Power Units are being shut down as planned. T+plus 9 minutes. It was a nominal MECO. A quick boost from the Orbital Maneuvering System engines is not required to reach the planned preliminary sub-orbital trajectory. T+plus 8 minutes, 33 seconds. MECO. Main Engine Cutoff confirmed! Discovery in space for its long-awaited mission to finish constructing the station's truss backbone. T+plus 7 minutes, 30 seconds. The main engines are beginning to throttle down to ensure the shuttle does not experience forces greater than 3 g's as it continues to accelerate prior to engine shutdown. T+plus 7 minutes, 6 seconds. Single engine press 104. The shuttle can reach orbit on the power from a single main engine should two fail at this point. But all three continue to fire properly. T+plus 6 minutes, 50 seconds. Discovery is 66 miles in altitude, traveling at 11,000 mph. T+plus 6 minutes, 25 seconds. "Press to MECO" Discovery can now achieve a safe orbit on two engines. All three remain in good shape. T+plus 5 minutes, 20 seconds. "Press to ATO". Discovery can reach an orbit, albeit a low orbit, on two engines should one shut down now. But all three powerplants are still running just fine. T+plus 4 minutes, 30 seconds. Discovery will be tripling its speed in the next four minutes to reach orbital velocity of 17,500 mph. T+plus 4 minutes, 20 seconds. Discovery is 62 miles in altitude, 177 miles downrange from the launch pad. T+plus 3 minutes, 15 seconds. Discovery is 48 miles in altitude, 83 miles downrange from the launch pad, traveling at 4,300 mph. T+plus 2 minutes, 45 seconds. Commander Lee Archambault just received the "Two-engine TAL" call from CAPCOM in Mission Control. The call means Discovery can now reach a Transatlantic Abort Landing site if one main engine fails. However, all three engines continue to burn normally. T+plus 2 minutes, 10 seconds. Mission Control confirms a good jettison of the solid rocket boosters has occurred. The spent boosters will parachute into the Atlantic Ocean for retrieval. Discovery continues its sunset streak toward space on the power generated by the three liquid-fueled main engines. T+plus 60 seconds. The shuttle is on course for Tuesday's rendezvous and docking with the international space station. Discovery is carrying the fourth and final solar array truss for the outpost that will boost the station to full power. T+plus 35 seconds. Discovery's three liquid-fueled main engines are easing back to two-thirds throttle to reduce the aerodynamic stresses on the vehicle as it powers through the dense lower atmosphere and breaks the sound barrier. T+plus 20 seconds. The roll maneuver has been completed, putting Discovery on the proper northeastward heading for this sunset ascent up east coast of the United States. T-minus 10 seconds, go for main engine ignition, fuel valves are opening, main engine start, 4, 3, 2, 1 and LIFTOFF! Liftoff of space shuttle Discovery on a mission to complete the power grid of the international space station! Now 90 seconds from launch of the 125th space shuttle mission. All remains "go" with Discovery for a sunset liftoff at 7:43 p.m. Discovery's power-producing fuel cells are transfering to internal reactants. The units will begin providing all electricity for the mission beginning at T-50 seconds. And pilot Tony Antonelli has been asked to clear the caution and warning memory system aboard Discovery. He will verify no unexpected errors in the system. T-minus 5 minutes. The "go" has been given for for Auxiliary Power Unit start. Pilot Tony Antonelli is now flipping three switches in Discovery's cockpit to start each of the three APU's. The units, located in the aft compartment of Discovery, provide the pressure needed to power the hydraulic systems of the shuttle. The units will be used during the launch and landing phases of the mission for such events as moving the orbiter's aerosurfaces, gimbaling the main engine nozzles and deploying the landing gear. Over the course of the next minute, the orbiter's heaters will be configured for launch by commander Lee Archambault, the fuel valve heaters on the main engines will be turned off in preparation for engine ignition at T-6.6 seconds and the external tank and solid rocket booster safe and arm devices will be armed. T-minus 6 minutes. Pilot Tony Antonelli has been asked by the orbiter test conductor to pre-start the orbiter Auxiliary Power Units. This procedure readies the three APU's for their activation after the countdown passes T-minus 5 minutes. T-minus 8 minutes and counting. Pilot Tony Antonelli has flipped the switches in the cockpit of Discovery to directly connect the three onboard fuel cells with the essential power buses. Also, the stored program commands have been issued to the orbiter for antenna alignment and management during launch. NASA launch director Mike Leinbach has conducted his poll and given approval to resume the countdown for liftoff at 7:43 p.m. EDT. The poll by NASA test director Steve Payne confirms there are no technical issues or constraints standing in the way of launch. The Range also reports "go" on the local weather. And Mission Control says that weather at abort landing sites is acceptable, too. Ten minutes are remaining in this built-in hold. Final readiness polls will be conducted over the next few minutes. The sun is setting on a spectacular Sunday evening in Florida. Skies are clear and Discovery's ascent should be seen throughout the region. Now 30 minutes from Discovery's launch on an eight-and-a-half minute trek to space. At main engine cutoff, Discovery will be flying on a suborbital trajectory with a high point of 136 statute miles and low point of 36 statute miles, inclined 51.6 degrees to the equator. A half-hour later, the twin orbital maneuvering engines will be fired to place the shuttle into a 142 by 98 statute mile orbit. At launch, the space station will be flying 224 miles above the Southern Ocean near Tasmania. Liftoff at 7:43:44 p.m. EDT is timed to place Discovery on course to dock with the station shortly after 5 p.m. EDT Tuesday. T-minus 9 minutes and holding. Countdown clocks have gone into the planned 45-minute, 44-second built-in hold. Today's launch is targeted for 7:43:44 p.m. EDT, a slight change two seconds earlier than previously advertised because of the latest orbital tracking of the space station. Mission Control in Houston has loaded Discovery's onboard computers with the proper guidance parameters based on the projected launch time. The Main Propulsion System helium system is being reconfigured by pilot Tony Antonelli. Soon the gaseous nitrogen purge to the aft skirts of the solid rocket boosters will be started. Now one hour away from launch of Discovery. The shuttle will truck into orbit the final segment of the international space station's truss backbone. With 10 pieces already installed on the outpost, the upcoming construction mission will deliver the far starboard truss and then unfurl a pair of giant power-generating solar arrays that stretch 240 feet tip-to-tip. The new wings, each with their 32,800 solar cells, will produce one-quarter of the station's electricity, enough to power about 30 houses. Carrying a crew of seven astronauts and the 31,127-pound truss payload, Discovery is scheduled for blastoff at 7:43 p.m. EDT. Pilot Tony Antonelli is configuring the displays inside Discovery's cockpit for launch while commander Lee Archambault enables the abort steering instrumentation. T-minus 20 minutes and counting. The countdown has resumed after a 10-minute hold. Clocks will tick down for the next 11 minutes to T-minus 9 minutes where the final planned hold is scheduled to occur. The hold length will be adjusted to synch up with today's preferred launch time of 7:43 p.m. The work to seal the shuttle's crew compartment hatch for flight is complete. And the closeout team that assisted the astronauts into Discovery this afternoon are preparing to leave the launch pad now. T-minus 20 minutes and holding. The countdown has paused for a 10-minute built-in hold. Launch is scheduled for 7:43 p.m. EDT. Everything is going smoothly with the countdown and current weather conditions are beautiful for a sunset blastoff. The Closeout Crew continues its work to button up the side hatch on Discovery. The odds of acceptable weather officially improved to 100 percent. The weather team says there's no chance of violating the launch rules today. Discovery's crew module hatch is swinging shut for launch. Just two hours remain until the planned liftoff time. Discovery's 13-day flight will connect the final segment of the space station's truss backbone and deploy the last remaining electricity-generating solar wings, boosting the station to full power. That added electricity is needed to support doubling the station's resident crew size to six people starting in May, as well as powering the international science laboratory modules. The "go" has been given to close Discovery's hatch. T-minus 90 minutes and counting. Countdown clocks continue to tick down to T-minus 20 minutes where the next hold is planned. Activities remain on track for liftoff at 7:43 p.m. The countdown is proceeding smoothly with no significant technical issues. The weather predictions still call for an 80 percent chance of acceptable conditions. The only concern could be a low-cloud ceiling developing. Steve Swanson, a Colorado native skilled in computer sciences, is the spacewalk leader for Discovery's flight and the shuttle's flight engineer as mission specialist No. 2. He will be going outside the space station during EVAs 1 and 2. During his one previous shuttle flight -- STS-117 in 2007 -- he conducted spacewalks that worked on the power trusses of the space station. Swanson just became the seventh and final crewmember to board Discovery. He will ride into space in the flight deck's aft-center seat. Koichi Wakata, an astronaut for the Japan Aerospace Exploration Agency, launches aboard Discovery as mission specialist No. 5. Once at the space station, he will join the Expedition 18 crew and replace astronaut Sandy Magnus as flight engineer. Wakata becomes the Japan's first long-duration crew member to serve on the station. Magnus will return to Earth on the shuttle to conclude four months in space. Wakata is climbing to the center seat on the middeck now. Joe Acaba is a geologist, Peace Corps. veteran and a math and science teacher. As mission specialist No. 1, he will be spacewalking during EVAs 2 and 3. He will ride into space for the first time of his career in the flight deck's aft-right seat. After some technical glitches, the live launch webcast with Miles O'Brien, David Waters and Leroy Chiao is underway from the Kennedy Space Center. The webcast can be seen on the right side of this page. Ricky Arnold is a math and science educator who has taught all around the world. He will serve as mission specialist No. 3 and perform EVAs 1 and 3, while Discovery is docked to the space station. The shuttle rookie is ingressing Discovery's crew module to take his seat on the middeck. Tony Antonelli, a commander in the Navy, will be Discovery's pilot. He has over 3,200 hours in 41 different kinds of aircraft and has completed 273 carrier arrested landings. John Phillips, a former space station resident who spent 180 days as the Expedition 11 science officer in 2005, serves as Discovery's mission specialist No. 4. He was a Navy pilot and later worked at Los Alamos National Laboratory. On the upcoming space mission, he will be busy throughout the flight with robot arm operations. Phillips just crawled through Discovery's hatch to take a seat on the middeck. Shuttle commander Lee Archambault, a 48-year-old Air Force colonel who flew the F-117A Stealth Fighter during combat missions in the first Gulf War, leads this two-week flight of Discovery. It will be his second spaceflight after serving as pilot on Atlantis' STS-117 mission in 2007. Discovery's crew has arrived at launch pad 39A. The AstroVan came to a stop on the pad surface near the Fixed Service Structure tower elevator that will take the seven-man crew to the 195-foot level to begin boarding the shuttle. Commander Lee Archambault, pilot Tony Antonelli, mission specialists Joe Acaba, Steve Swanson, Ricky Arnold, John Phillips and station-bound astronaut Koichi Wakata just departed the Kennedy Space Center crew quarters to board the AstroVan for the 20-minute ride from the Industrial Area to launch pad 39A on the edge of the Atlantic Ocean. T-minus 3 hours and counting. The countdown clocks are ticking again after the planned two-and-a-half hour built-in hold. Clocks will proceed to T-minus 20 minutes when the next hold is scheduled. A final hold occurs at the T-minus 9 minute mark to synch up with the 7:43:46 p.m. EDT launch time. Having completed their work, the Final Inspection Team is packing up to depart launch pad 39A. NASA says the team didn't find any areas of concern. Ironically, they did spot a bat hanging on the external tank. The special team sent into the pad to adjust a helium pressure valve has completed its task, NASA says. The crew's work won't delay the countdown to launch. "This will not interfere," test director Steve Payne said. "We do this every now and then as necessary, it's a procedure we've done many times in the past when we've had to go into the pad to retrieve something or adjust something last minute." The crew has donned the day-glow orange launch and entry partial pressure spacesuits. After final adjustments and pressure checks, the astronauts will depart the suitup room and take the elevator down to the ground level of the Operations and Checkout Building to board the AstroVan for the trip to launch pad 39A around 3:53 p.m.
A short time ago, commander Lee Archambault, pilot Tony Antonelli and flight engineer Steve Swanson received a weather briefing on conditions at the Kennedy Space Center and the primary abort landing sites. Weather is not expected to be a constraint to launching on time today. NASA test director Steve Payne says this helium pressure measurement issue won't be a show stopper for today's launch of Discovery. The webcast is experiencing a technical problem. The guys hope to be live shortly. Coming up at 3 p.m. EDT, join Miles O'Brien, David Waters and Leroy Chiao for today's live countdown and launch webcast from the Kennedy Space Center. The webcast can be seen on the right side of this page. Launch director Mike Leinbach has dispatched a special team to pad 39A to adjust a ground system valve in the mobile launcher platform that should increase the helium pressure in one of four liquid hydrogen gap measurement plates between Discovery and external tank that is below limits. The Final Inspection Team is performing its observations of Discovery this afternoon. The latest report from the Firing Room 4 of the Complex 39 Launch Control Center says one minor issue is being addressed in the countdown. From spokeswoman Candrea Thomas: "Teams are monitoring a drop in helium pressure in one of four liquid hydrogen gap measurement plates at the liquid umbilical disconnect where the orbiter connects to the tank. The gap measurement plate maintains a possive purge between the external tank and the orbiter interface to prevent potential ice formation and keeps electrical equipment at the right temperature. All four gap measurements are working, but one has dipped slightly below requirements. The condition will be monitored but is not currently expected to impact tonight's launch. Teams also are exploring the option of manually adjusting the ground system valve in the mobile launcher platform to assist in increasing the pressure." Commander Lee Archambault is leading the flight of Discovery. He'll be joined by pilot Tony Antonelli and mission specialists Joe Acaba, Steve Swanson, Ricky Arnold, John Phillips and station-bound astronaut Koichi Wakata. The veteran Japanese flier will replace Sandy Magnus as a member of the station's Expedition 18 resident crew. Magnus returns to Earth aboard Discovery to complete her four-month flight. Discovery's crew was awakened at 9 a.m. to begin their launch day routine. They had breakfast at 9:30 a.m., then went into the final round of pre-flight medical checks at 10:30 a.m. The seven astronauts will begin suiting up shortly after 3 p.m., followed by departure from crew quarters at 3:53 p.m. and arrival at the launch pad a half-hour later to start strapping aboard the shuttle. Discovery's crew module hatch is scheduled to be closed for flight a little after 5:30 p.m. EDT. For those keeping score at home, the fueling of space shuttle Discovery officially began at 10:20 a.m. and concluded at 1:21 p.m. EDT. "No issues were worked during the tanking operation today," NASA spokesman George Diller says. Tank now full! The external fuel tank has been fully loaded with a half-million gallons of supercold liquid oxygen and liquid hydrogen. With the hazardous tanking operation completed, the Orbiter Closeout Crew and Final Inspection Team will head out to the pad to perform their jobs. The closeout crew will ready Discovery's crew module for the astronauts' ingress in a couple of hours; and the inspection team will give the entire vehicle a check for any ice formation following fueling. T-minus 3 hours and holding. Clocks have entered a planned two-hour, 30 minute built-in hold. The liquid oxygen tank is in stable replenish mode now. Standing by for confirmation of hydrogen replenish has started. Loading of liquid oxygen tank in fast-fill mode has been completed and the tank is being topped off. "Our tanking operation has gone very successfully," NASA spokesman George Diller says. "Right now, we're not working any issues that we see that would preclude an on-time liftoff at 7:43 p.m. this evening." The liquid oxygen tank is 85 percent full and the liquid hydrogen tank level is above 98 percent with no leakage detected. Coming up at 1 p.m. EDT, join Miles O'Brien, David Waters and Leroy Chiao for a live webcast update from the Kennedy Space Center. The webcast can be seen on the right side of this page. Liquid hydrogen topping is underway. The fueling operation has progressed beyond the point where the leak began on Wednesday. Replacement of hardware at the launch pad over the past couple of days seems to have solved the leak. "We are not seeing any indication of leakage at all," NASA spokesman George Diller reports from the Launch Control Center. "It appears the system is tight." The gaseous hydrogen vent valve has been cycled and no leakage was observed. So far, so good for Discovery. The liquid hydrogen tank has reached the 98 percent mark and will be going into topping mode. The launch team will be closely monitoring the gaseous hydrogen vent system for any signs of leakage. The leak that scrubbed Wednesday's countdown occurred at this point. Now passing the 50 percent levels on the liquid hydrogen and liquid oxygen tanks. The liquid hydrogen and liquid oxygen tanks are both about one-quarter full. NASA says the fueling operation is going uneventfully today. The process started with the chilldown thermal conditioning of systems at 10:20 a.m., followed by a slow-fill mode and then the fast-fill mode for both liquid hydrogen and liquid oxygen. Once each tank has been loaded, they will enter a stable replenishment mode that ensures the cryogenic supplies are topped off through the final minutes of the countdown. Liquid hydrogen and liquid oxygen loading switched to the "fast-fill" mode at 11:07 a.m. EDT as fueling of space shuttle Discovery proceeds via remote control at launch pad 39A. The gaseous hydrogen vent system that had the leak on Wednesday will be checked out once the tank reaches 98 percent full. There are no technical issues being addressed by the launch team, NASA says. Both liquid hydrogen and liquid oxygen are continuing in "slow-fill" mode. The liquid hydrogen loading has transitioned from chilldown to the "slow-fill" mode. This fills a small fraction of the tank, then the loading switches to "fast-fill" mode. Fueling begins. Today's filling of space shuttle Discovery's external fuel tank started at 10:20 a.m. EDT with the chilldown thermal conditioning process. This will be followed by the slow-fill mode and then the fast-fill mode to load the tank over the next three hours. The NASA test director in Firing Room 4 has instructed the launch team to begin the fueling operation. T-minus 6 hours and counting. Clocks have just resumed ticking following another of the countdown's planned built-in holds. The next hold occurs at the T-minus 3 hour mark. Launch of Discovery remains targeted for the precise moment of 7:43:46 p.m. EDT (2343:46 GMT). The Mission Management Team has completed its pre-fueling meeting and given the launch team approval to begin filling space shuttle Discovery's external tank with its cryogenic propellants as planned this morning. Free video: David Waters reports from the Kennedy Space Center that NASA will try again to launch the space shuttle Discovery after repairing a hydrogen leak. Our morning update story can be read here. The countdown for Discovery's second launch attempt began overnight as planned. The Mission Management Team will meet at 9:45 a.m. to give a "go" for fueling of the shuttle this morning. A NASA spokesman says there are no issues being worked and liftoff remains targeted for 7:43 p.m. EDT. Weather forecasters continue to predict an 80 percent chance of acceptable conditions at launch time. "A high pressure ridge is located over east central Florida and a cold front is moving into the southeast U.S. Over the next few days, moisture will increase in the atmosphere in Florida as the front gradually moves into the area by Tuesday," the weather team reported this morning. "Overall, weather is favorable for launch today with a chance of a low-cloud ceiling being the main concern." The gantry-like rotating service structure at Kennedy Space Center's pad 39A has been retracted from Discovery tonight. It's the first visible sign that another launch attempt is getting underway for the space shuttle. NASA believes the leak in the gaseous hydrogen venting system has been fixed by the replacement of hardware since Wednesday's postponement. However, officials won't know for sure until Discovery is fueled and no leaks are detected. Countdown clocks will resume ticking at 3:18 a.m. EDT from the T-minus 11 hour mark. Final closeouts of the launch pad and clearing of the hazard area occurs by dawn. The count will proceed down to the T-minus 6 hour point where a two-hour hold begins at 8:18 a.m. During that pause, the launch team will verify all systems are ready to begin loading a half-million gallons of supercold rocket fuel in the shuttle's external tank. The three-hour fueling process is scheduled to commence around 10:18 a.m. EDT, pending a final "go" from the Mission Management Team's morning meeting to review the status of work. The official launch window, based on the latest revision from Mission Control, extends from 7:38:45 p.m. to 7:48:46 p.m. EDT. The targeted liftoff time occurs in the middle of the window at 7:43:46 p.m. EDT. That's the moment when Earth's rotation carries the launch pad into the plane of the station's orbit. As the space shuttle launch team gears up for another shot at sending Discovery into orbit, rollback of the pad 39A rotating service gantry just got underway. The structure is slowly moving away from the orbiter in preparation for Sunday's fueling and the planned 7:43 p.m. EDT launch. Engineers fell several hours behind schedule today fixing an alignment issue and re-connecting a gaseous hydrogen vent line to the shuttle Discovery's external tank, but NASA managers say they should be able to make up the lost time and stay on track for a launch attempt Sunday at 7:43 p.m. EDT. Space shuttle Discovery is slated for a sunset blastoff Sunday to deliver the final power truss to the international space station. "We're good to go tomorrow," Mission Management Team chairman Mike Moses says. "We're looking forward to getting the countdown running." The Ground Umbilical Carrier Plate seven-inch quick disconnect removal and replacement is being finished and workers are in the processing of buttoning up the area, launch director Mike Leinbach says. The work is running three to four hours behind the expected timeline after an alignment issue was experienced this morning. However, officials say the team should be able to catch up tonight. "No significant issues there in terms of making our schedule. I think we're in really good shape," Moses said. "The team had a little hiccup this morning that generated a little talking about, but everything is good." The Mission Management Team completed its meeting this afternoon and reported the rest of the space shuttle is in good shape for launch. Retraction of the rotating service gantry at pad 39A remains targeted to occur at 8:30 p.m. EDT. The reconnection of ordnance is planned after midnight. Countdown clocks will resume ticking at 3:18 a.m. EDT. Sunday's updated liftoff time is 7:43:46 p.m. EDT. The activities at pad 39A are running a little later than planned because technicians ran into an alignment problem today, after performing repairs to the gaseous hydrogen vent system. "Early this morning, while installing the replacement seven-inch quick disconnect, crews discovered the Ground Umbilical Carrier Plate (GUCP) was not aligned properly with the external tank. The left and right pivot seat was not fully connecting to the external tank's pin receptacle sleeve at the bottom of the GUCP. Crews now are in the process of checking alignments and making adjustments to get a proper fit. Leak checks will be performed following the adjustments," NASA says in a statement. The Mission Management Team is conducting its pre-launch meeting right now. A news conference is scheduled for 2:30 p.m. EDT with Mission Management chairman Mike Moses, station program manager Mike Suffredini, shuttle launch director Mike Leinbach and weather officer Kathy Winters. Work continues at launch pad 39A to make the repairs that NASA hopes will fix the gaseous hydrogen leak. The lengthy re-torquing sequence for the Ground Umbilical Carrier Plate, or GUCP, that attaches to the backside of the external fuel tank began at 3 a.m. today and should be completed around 6 p.m. EDT. Rollback of the pad's service gantry is scheduled for 8:30 p.m., followed by resumption of the launch countdown shortly after 3 a.m. Sunday. Sunday's fueling of Discovery begins around 10:15 a.m., leading toward a liftoff at 7:43 p.m. EDT. The latest weather forecast still predicts an 80 percent chance of allowable conditions for launch. The launch time outlook calls for scattered clouds at 4,000 and 20,000 feet, 7 miles of visibility, southerly winds from 160 degrees at 9 peaking to 13 knots and a temperature of 72 degrees F.
Countdown clocks will resume ticking at 3:18 a.m. EDT from the T-minus 11 hour mark. Final closeouts of the launch pad and clearing of the hazard area occurs by dawn. The count will proceed down to the T-minus 6 hour point where a two-hour begins at 8:18 a.m. During that pause, the launch team will verify all systems are ready to begin loading a half-million gallons of supercold rocket fuel in the shuttle's external tank. And the updated flight plan for Discovery's mission has been released. You can see it here. The updated flight plan for Discovery's mission has been released. You can see it here. Forecasters are predicting an 80 percent chance of good weather for Sunday night's 7:43 p.m. EDT liftoff of the space shuttle Discovery. "An upper-level ridge is still dominant over Florida bringing scattered skies to KSC for the next four days. Low-level moisture will gradually increase with southerly winds ahead of an approaching frontal system. On Tuesday, the front will pass through KSC bringing an increased chance for showers and gusty winds. Overall, weather is favorable for launch on Sunday with only a slight chance of a low-cloud ceiling and cumulus clouds," the launch weather team reported today. The launch time outlook calls for scattered cumulus clouds at 4,000 feet and scattered cirrus clouds at 20,000 feet, 7 miles of visibility, southerly winds from 160 degrees at 8 peaking to 12 knots and a temperature of 72 degrees F.
The low clouds forming a ceiling around 4,000 feet would be the concern for Sunday. If the launch should slip to Monday, there's a 70 percent chance of acceptable weather. Low clouds and showers are the worries for the 7:18 p.m. liftoff. The outlook for Tuesday's 6:55 p.m. launch time has concerns for low clouds, rain showers and crosswinds at the shuttle's emergency runway, dropping the odds of acceptable weather to 40 percent. Miles O'Brien reports from the Kennedy Space Center on the hydrogen leak that forced NASA to postpone the launch of shuttle Discovery on a mission to the space station. He is joined by former astronaut Leroy Chiao and veteran space reporter David Waters. NASA cancelled this afternoon's meeting and officials say liftoff plans for Sunday will proceed. "Today's scheduled 4 p.m. EDT status meeting to discuss yesterday's scrub of space shuttle Discovery was cancelled. Based on all of the work done during the last 24 hours, teams believe they have sufficient understanding of the hydrogen leak to press for a Sunday launch at 7:43 p.m.," the space agency said in a statement. The Mission Management Team meeting will gather on Saturday for a meeting at 1 p.m. Check back for full story shortly. The post-scrub press conference is underway at the Kennedy Space Center. The next launch opportunity is being targeted for no earlier than Sunday, with a liftoff time of 7:43 p.m. EDT. The leak was found near the end of fueling space shuttle Discovery's external tank this afternoon in the gaseous hydrogen venting system. Troubleshooting and efforts to cycle valve in the system failed to fix the leak. Engineers are sure there is a hardware problem, most likely on the launch pad-side of the interface. The tank has been drained of the liquid hydrogen and liquid oxygen following the scrub. A 20-hour inerting of the tank must be performed before technicians can get their hands on the hardware. More meetings are planned for tomorrow to assess the schedule. NASA says they'll now have until Tuesday to get Discovery off the ground. We'll have a full story from the news conference later today. NASA engineers say it will be Sunday at the earliest before shuttle Discovery could be readied for another launch attempt, pending work to resolve the leak problem. The space station residents were informed that launch would likely slip to Sunday or Monday. Officials are facing a Monday deadline for getting the shuttle launched before the upcoming Soyuz crew exchange mission. Otherwise, Discovery would have to wait till around April 7 to launch. A news conference is coming up at 6:30 p.m. EDT. The live webcast can be viewed at this link. Check out our story on today's scrub here. Coming up at 4:30 p.m. EDT, we will host a webcast with Miles O'Brien, David Waters and Leroy Chiao. Join us for the live update from the Kennedy Space Center to hear a report on the scrub and NASA's plans for another launch attempt. To recap, this evening's launch of the space shuttle Discovery was postponed due to a leak in the gaseous hydrogen venting system between the backside of the external tank and the launch pad umbilical arm. See a picture here. Engineers are troubleshooting to determine whether the problem is in the ground equipment or with the tank. NASA says the Mission Management Team will meet at 5 p.m. to review the gathered data and map out the strategy going forward. An evening news conference is planned to announce the MMT's decisions. If the problem can be resolved quickly, another launch attempt could be made tomorrow. The launch time would be 8:54 p.m. EDT. Shuttle officials will be having meetings this afternoon to assess options to fix the problem with a hydrogen vent line. A news conference is expected later today. NASA spokeswoman Candrea Thomas says there was a leak somewhere around a ground umbilical carrier plate between support equipment and the shuttle. The launch team is draining the liquid hydrogen tank and plan to cycle a valve as part of troubleshooting. This delay will be at least 24 hours. SCRUBBED. A NASA spokesman says today's launch attempt has been scrubbed due to the hydrogen leak. More information to come. The loading of liquid hydrogen into the external fuel tank has been stopped while the launch team assesses a possible leak in the umbilicals. Liquid oxygen filling is continuing while the troubleshooting is underway. The cryogenics are pumped from storage spheres at the pad, through feed lines to the mobile launcher platform, into Discovery's aft compartment and finally into the external fuel tank. It is a beautiful day at the Kennedy Space Center as fueling of Discovery is proceeding smoothly. The liquid hydrogen low-level engine cutoff sensors in the bottom of the external tank have undergone initial testing today after they were submerged by propellant during the first hour of fueling. The launch team sent commands to test the health of the sensors and a NASA spokesman says the expected readings were received from the sensors, indicating all four are working properly. FUELING UNDERWAY. The filling of space shuttle Discovery's external fuel tank with a half-million gallons of supercold propellants has begun at launch pad 39A. The tanking operation commenced with the chilldown thermal conditioning process at 11:56 a.m. EDT. The Mission Management Team met earlier this hour and gave the "go" to begin fueling. Engineers in Firing Room 4 then started the three-hour fueling process as scheduled. T-minus 6 hours and counting! The coundown has resumed ticking after the two-hour planned hold. The next scheduled hold occurs at T-minus 3 hours. Later pauses happen at T-minus 20 minutes and T-minus 9 minutes to give the launch team time to catch up on work running behind schedule and deal with any problems. Liftoff is targeted for precisely 9:20:14 p.m. EDT. The Mission Management Team met a short time ago and gave approval to begin fueling space shuttle Discovery for tonight's launch. There are no significant problems being worked and liftoff remains on schedule for 9:20 p.m. EDT. Air Force weather forecasters now predict a 95 percent chance of acceptable conditions at launch time. The only slight concern would be a low cloud ceiling developing, but that appears highly unlikely. The outlook calls for just a few cumulus clouds at 3,000 feet, 7 miles of visibility, southeasterly winds from 130 degrees at 7 knots and a temperature of 69 degrees F.
Shuttle Discovery's countdown continued ticking along overnight as technicians and engineers ready the spacecraft for fueling and launch. Filling of the giant external fuel tank should get underway around 12 noon EDT. Liftoff remains on schedule for 9:20 p.m. EDT this evening. The seven astronauts will be awakened at 11 a.m. to begin their launch day routine, leading to suitup shortly before 5 p.m., departure from crew quarters at 5:30 p.m. and arrival at the launch pad by 6 p.m. to start strapping aboard the shuttle. Discovery's crew module hatch is scheduled to be closed for flight a little after 7 p.m. EDT. The rotating service structure at launch pad 39A was rolled back right on schedule as activities proceed for Wednesday's 9:20 p.m. EDT launch. The gantry has provided the primary access and weather protection for space shuttle Discovery during its stay on the seaside complex. The structure's rollback reveals the orbiter and accomplishes a key milestone in the countdown. Work overnight will include activating the Discovery's inertial measurement units and power-generating fuel cells, plus checking all of the switches in the cockpit to ensure they are in the correct positions for launch. At 4:55 a.m. EDT, countdown clocks will resume ticking following the half-day hold at the T-minus 11 hour mark. The count will proceed down to the T-minus 6 hour point where a two-hour begins at 9:55 a.m. During that pause, the launch team will verify all systems are ready to begin loading a half-million gallons of supercold rocket fuel in the shuttle's external tank. The three-hour fueling process is scheduled to commence around 12 noon EDT, pending a final "go" from the Mission Management Team's morning meeting to review the status of the count and the latest weather outlook. The official launch window, based on the latest revision from Mission Control, extends from 9:15:13 p.m. to 9:25:14 p.m. EDT. The targeted liftoff time occurs in the middle of the window at 9:20:14 p.m. EDT. That's the moment when Earth's rotation carries the launch pad into the plane of the station's orbit. 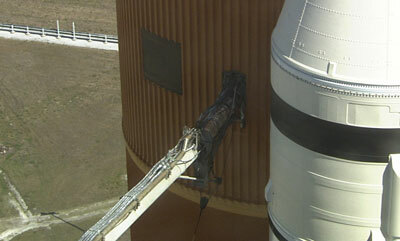 Retraction of the pad's service tower has started. The shuttle Discovery's countdown continues to tick smoothly toward launch Wednesday on a space station assembly mission. Aboard the station, meanwhile, commander Mike Fincke and flight engineer Yury Lonchakov are gearing up for a spacewalk this afternoon to mount a European experiment packaged on the hull of the Zvezda command module and to complete a variety of other tasks. Reactants for space shuttle Discovery's electricity-generating fuel cells were loaded into storage spheres beneath payload bay Monday afternoon and evening as standard work continues at pad 39A for Wednesday's launch. The liquid hydrogen and liquid oxygen are combined to produce power and a byproduct of drinking water during the shuttle's mission. Workers pumped the cryogenics into small tanks aboard the orbiter during a multi-hour operation, then later demated the pad umbilical system used in the loading process and stowed the equipment for launch. Countdown clocks will enter the lengthy T-minus 11 hour planned hold period at 3 p.m. EDT. The built-in hold will last 13 hours and 7 minutes. The giant gantry-like rotating service structure is scheduled for retraction from around Discovery at 1 a.m. The shuttle Discovery's countdown to launch Wednesday is proceeding smoothly, officials said today, with no technical problems of any significance at the launch pad and excellent weather expected throughout the week. Space shuttle Discovery is in good shape as the countdown continues toward launch at 9:20 p.m. EDT on Wednesday night. "Right now, we're not tracking any issues in the Firing Room that would prevent any major milestones," shuttle launch director Mike Leinbach says. "The team is anxious to go, we're fully trained, ready to execute this mission." The Mission Management Team gathered this morning for the Launch Minus-2 Day meeting to assess the progress of recent work to ready Discovery for flight. "Quite literally, it was a pretty fast meeting," said chairman Mike Moses. The first in a series of planned built-in holds began at the T-minus 27 hour point. This four-hour hold stretches from 11 a.m. to 3 p.m. EDT, and serves as a block of time to catch up on work that could be running behind schedule or deal with problems. During the planned hold, checks of the shuttle's pyrotechnic controllers will be conducted. And then the rest of the afternoon and evening will be spent loading the orbiter's three electricity-generating fuel cells with their liquid hydrogen and liquid oxygen reactants. COUNT BEGINS. Inside Firing Room 4 of Kennedy Space Center's Launch Control Center, countdown clocks have started ticking toward the liftoff of space shuttle Discovery. Launch team members gathered for the "call to stations" at 6:30 p.m. EDT, and then the three-day countdown commenced at 7 p.m. as scheduled. Clocks read T-minus 43 hours and counting. But a series of holds are timed throughout the next few days, leading to Wednesday's targeted liftoff time of 9:20 p.m. EDT. The early portion of the count involves buttoning up launch pad equipment and removing platforms inside the shuttle's crew module, reviewing flight software stored in Discovery's mass memory units, loading backup software into the general purpose computers and testing navigation systems. Read our story on today's crew arrival. Welcome to Florida! The seven men to launch aboard space shuttle Discovery have arrived at the Kennedy Space Center. Commander Lee Archambault, pilot Tony Antonelli, mission specialists Joe Acaba, Steve Swanson, Ricky Arnold, John Phillips and station-bound astronaut Koichi Wakata traveled from Houston to the Cape in a wave of T-38 training jets. Over the next three days, the crew will undergo final medical checks, review the flight plan, practice landing approaches at the shuttle runway and spend some time relaxing before the hectic two-week space mission. The start of Discovery's launch countdown occurs later today at 7 p.m. EDT. Liftoff remains scheduled for 9:20 p.m. EDT Wednesday. "We're ready to get going," Archambault just told reporters gathered at the runway. The other two T-38s with Antonelli, Arnold and Wakata are flying around launch pad 39A before landing. Crew arrival is happening now. The first three T-38s are taxiing down the Shuttle Landing Facility runway with Archambault, Acaba, Swanson and Phillips. Discovery's seven astronauts have departed Ellington Field near the Johnson Space Center in Houston for today's flight over to the Kennedy Space Center to begin final launch preparations. The crew is expected to arrive around 2:30 p.m. EDT at the Florida spaceport. Forecasters are predicting a 90 percent chance of good weather for Wednesday night's 9:20 p.m. EDT liftoff of the space shuttle Discovery. "An upper-level ridge will remain dominant over Florida this week causing mild temperatures and benign weather conditions. Currently, a surface high pressure ridge is located over North Florida, and low-level southeasterly flow is prevalent over East Central Florida. An occasional low-cloud ceiling will affect the area over the next 24 hours, but low-level moisture will decrease by the evening of launch, significantly reducing the chance for a cloud ceiling," the launch weather team reported today. The launch time outlook calls for just a few cumulus clouds at 3,000 feet, 7 miles of visibility, southeasterly winds from 130 degrees at 7 knots and a temperature of 69 degrees F.
The low clouds forming a ceiling would be the only concern for Wednesday. If the launch should slip to Thursday or Friday, there's an 80 percent chance of acceptable weather on those evenings. Low clouds and the slight chance of rain showers within 20 miles of the shuttle's emergency runway would be the worries both days. See our initial story on the FRR here. NASA managers today formally cleared shuttle Discovery for launch next Wednesday night. The Flight Readiness Review ended a short time ago and established Wednesday as the official launch date. The news conference from Kennedy Space Center remains scheduled for 2:30 p.m. to talk about resolving the gaseous hydrogen flow control valve issue after this long period of analysis and testing. "Using a detailed inspections, there are three valves that have been cleared of crack indications now installed in Discovery to support the STS-119 mission," NASA said in a statement today. "The three flow control valves, one for each space shuttle main engine, channel gaseous hydrogen from the engines through the main propulsion system and back to the external fuel tank. This flow regulation maintains the tank's structural integrity and delivers liquid hydrogen to the engines at the correct pressure." The third Flight Readiness Review for shuttle Discovery's launch is underway at Kennedy Space Center today. The meeting officially decides whether to proceed with next Wednesday's scheduled liftoff on the two-week mission to the space station. Watch this page for the announcement. NASA plans a post-FRR news conference at 2:30 p.m. EST. NASA managers Tuesday ordered engineers to replace suspect hydrogen flow control valves aboard the shuttle Discovery with valves that have less flight time in a bid to reduce the chances of in-flight cracks that could lead to debris in a pressurization line. We will have a complete story later tonight. Gerstenmaier says there's a "realistic" chance that Discovery can be cleared for launch before the mid-March deadline caused by the next Soyuz mission to the space station. John Shannon, the shuttle program manager, says more work is planned to wrap up the valve issue and meetings next week could possibly allow a firm launch date to be established. Launch director Mike Leinbach says pre-flight preparations are in a holding pattern with about five days away liftoff. The engineers need more time to finish work on the flow control valve issue, Associate Administrator for Space Operations Bill Gerstenmaier says. A new target date has not been set. It appears that launch of Discovery has been placed on hold. Workers are being told that all planned work this weekend is cancelled. The briefing time has been pushed to 10:30 p.m. EST. The flight readiness review has ended but NASA officials did not set a launch date for Discovery, an agency spokesman says. Managers are en route to the KSC Press Site for a news conference to describe what occurred in today's meeting and the plan going forward. The latest projected start time for the briefing is 9:15 p.m. EST. Now 9 p.m. EST at the earliest. The briefing has been pushed back to 8:30 p.m. EST. Now 8 p.m. EST at the earliest. The briefing time has been pushed back to no earlier than 7:30 p.m. EST. The news conference is no earlier than 7 p.m. EST. The engineering meeting is continuing at Kennedy Space Center. NASA says the post-review press conference won't begin any earlier than 6 p.m. EST. The launch time for February 19, if Discovery is cleared for launch that day, would be 4:41 a.m. EST. An updated launch windows chart is available here. Teams need more time to analyze the flow control valve system on the space shuttle, says Bill Gerstenmaier, NASA's associate administrator for Space Operations. That means Discovery's launch will be delayed from the original February 12 target date. Engineers will report their findings next Tuesday. If the information clears up all the questions, another Flight Readiness Review would follow next Thursday. Gerstenmaier says the earliest Discovery could launch is February 19. NASA officials did not set an official launch date during today's Flight Readiness Review and sources say the liftoff is likely to be delayed about a week. Continuing engineering analysis of the hydrogen flow control valves and the problem seen during the last shuttle flight has prompted NASA to postpone Discovery's liftoff, sources say. The launch had been targeted for February 12. A NASA news conference will begin in a few minutes. And check back shortly for a full story. Check out our story on the Flight Readiness Review and the reboost problem aboard the space station here. Senior NASA managers will caucus at the Kennedy Space Center on Tuesday to review space shuttle Discovery's preparedness for flight and formally establish the launch date. The traditional meeting held before every shuttle mission assesses the readiness of elements supporting the program, reviews the progress of pre-flight work, debates technical issues and then sets the official launch date. NASA plans a post-meeting news conference around 6 p.m. EST. The day-long Flight Readiness Review will decide whether to clear Discovery for its targeted launch date of February 12 on a two-week mission to deliver the final segment of the space station's truss structure. Next Thursday's launch time would be 7:32 a.m. EST. At launch pad 39A, activities continue toward starting the launch countdown next Monday morning. New gaseous hydrogen flow control valves that balance the pressure between the external tank and main engines have been put into Discovery, closeouts of the shuttle compartments are proceeding and final launch-critical ordnance installation is underway. Also, waves of tankers have replenished the liquid hydrogen and liquid oxygen storage spheres around the pad. Despite frigid temperatures that would have scrubbed a real space shuttle launch attempt, Discovery's seven astronauts climbed aboard their spacecraft at pad 39A for a practice countdown this morning. The Astrovan delivered the astronauts to the seaside pad around 8 a.m. EST to begin entering Discovery and taking their assigned seats just like the actual countdown in a few weeks. Clocks ticked down to the final seconds before ending with a mock abort around 11 a.m. EST. The three-day Terminal Countdown Demonstration Test wrapped up with the suited astronauts exiting the shuttle to rehearse emergency evacuation procedures. "This is a very valuable training, the only time we get to have this training," commander Lee Archambault said. "We do all our training down in Houston at the Johnson Space Center. We get out here very seldom for official training. This is really the culmination of our training, when we get the chance to come out here (and) spend a couple of days on the pad." The crew, which also includes pilot Tony Antonelli, mission specialists Joe Acaba, Steve Swanson, Ricky Arnold, John Phillips and station-bound astronaut Koichi Wakata, will fly back to Houston later today to finish preparations there and then go into pre-flight quarantine. Discovery was moved out to launch pad 39A from the Vehicle Assembly Building a week ago today. Immediately after getting secured on the pad, system hookups and validation checks got underway. Technicians then got to work on testing the main engines and aerosurface flight controls, running helium leak checks of the main propulsion system and starting preps for loading hypergolic propellants into the shuttle. The primary payload for the mission -- the space station's Starboard 6 solar array power truss -- was transferred into Discovery's cargo bay from the pad's cleanroom last Saturday. Upcoming activities include the actual loading of those storable propellants and fuels into the shuttle, stowing the spacewalking suits aboard the spacecraft, closing out of the orbiter's aft engine compartment and connecting ordnance devices. The launch countdown is slated to begin on Monday, February 9, leading to liftoff a half-hour after sunrise on February 12 at 7:32 a.m. EST (1232 GMT). The astronauts's return to the Cape is expected during the weekend prior to the countdown starting. Discovery's two-week flight will connect the final segment of the space station's truss backbone and deploy the last remaining electricity-generating solar wings. It will boost the station to full power. "(The station) will have the full complement of power to operate all of the labs," Archambault said. "To fully utilize those labs, we'll need all the power. So we're going to give it to them, and hopefully everything will be working just fine when we leave." While the Inauguration festivities were underway in Washington on Tuesday, a countdown dress rehearsal and emergency training drills continued at Kennedy Space Center to prepare for shuttle Discovery's upcoming launch carrying the final space station power truss segment. Led by commander Lee Archambault, the Discovery crew of pilot Tony Antonelli, mission specialists Joe Acaba, Steve Swanson, Ricky Arnold, John Phillips and station-bound astronaut Koichi Wakata traveled from Houston to the Cape on Monday morning. The crew came to Florida for the Terminal Countdown Demonstration Test, or TCDT. Every shuttle crew undergoes this multi-day training exercise in the final weeks before a planned launch. The astronauts spent time Tuesday learning how to evacuate pad 39A if an emergency arises, including procedures to operate the slide-wire baskets that would quickly whisk the crew from the launch tower to a bunker west of the pad, and earlier Monday afternoon they test-drove an armored tank available for the astronauts to escape the area. Other activities on their schedule this week include flying landing approaches in the Shuttle Training Aircraft, trying on spacesuits for fit checks and inspecting the 15.5-ton truss payload that was installed into Discovery's cargo bay last Saturday. The TCDT culminates Wednesday when the crew boards Discovery for a full countdown simulation. The astronauts will follow a normal launch morning routine with breakfast, a weather briefing on conditions at the Cape and various abort landing sites, then don their suits and depart crew quarters at about 7:45 a.m. to board the Astrovan that will take them to pad 39A. This is considered a "dry" countdown, as the shuttle's external tank won't be fueled. And the crew won't actually leave the tower in the escape baskets either. Discovery is scheduled for launch February 12 on a two-week mission to deliver and activate the Starboard 6 solar array truss that will bring the space station to full power. In addition, Wakata will become the first Japanese astronaut to serve as a long-duration resident crew member aboard the station, replacing Sandy Magnus as an Expedition 18 flight engineer. She will return to Earth on Discovery after more than three-and-a-half months living on the station. The mobile launch platform was lowered onto the pad pedestals at 12:16 p.m. EST, marking the official time for Discovery's arrival at pad 39A. Also upcoming in the next couple of days will be the installation of the Starboard 6 truss into the shuttle's payload bay. The crawler-transporter is making good progress toward the launch pad on this chilly Florida morning. The short delay in the start of today's rollout allowed technicians to complete work on the aft-skirt purges and mobile launch platform heaters, which are needed when temperatures are below 45 degrees F, a NASA spokeswoman said. ROLLOUT UNDERWAY. Poised to fly the 125th mission of the space shuttle program, Discovery is making its early morning journey from the Vehicle Assembly Building to launch pad 39A. The rollout began at 5:17 a.m. EST. Discovery had spent the past week inside the VAB being attached to the external fuel tank and twin solid rockets atop a mobile platform in preparation for launch February 12 carrying the final section of the international space station's solar array truss structure. Hauling the shuttle stack out to the pad is one of NASA's two Apollo-era crawler-transporters. The three-and-a-half mile trek will take about six hours to complete. The combined weight of the transporter, mobile launch platform and shuttle is 17.5 million pounds. Rollout of space shuttle Discovery has not yet gotten underway this morning. The team of workers responsible for getting space shuttle Discovery moved from the Vehicle Assembly Building to launch pad 39A are arriving on station for this morning's rollout. The ground crew have about four hours of work to complete before the shuttle begins moving. The crawler-transporter will use its hydraualics to pick up the mobile launch platform upon which Discovery is riding. The platform has been anchored to pedestals in the Vehicle Assembly Building. The transporter will haul the platform and shuttle on the three-and-a-half mile trip to pad 39A, a drive that should take about six hours to complete. The roll remains scheduled to begin at 4 a.m. EST. Final work is being completed on the fully-assembled space shuttle Discovery ahead of Wednesday morning's six-hour journey to launch pad 39A. The rollout team will report for duty at midnight, leading to first motion of crawler-transporter around 4 a.m. EST. Meanwhile, the mission's payload has been safely stashed away inside the pad's cleanroom. Once Discovery gets on the pad and the gantry is moved to enclose the shuttle, the payload bay doors will be opened to allow the 31,000-pound Starboard truss structure to be moved into the orbiter for launch. Work continues inside the Vehicle Assembly Building on space shuttle Discovery and its fuel tank and boosters. The comprehensive interface test to confirm good electrical and mechanical connections between the now-stacked shuttle will begin later today. Rollout to launch pad 39A remains targeted to begin at 4 a.m. EST on Wednesday. The 3.5-mile trip will take about six hours to complete. Meanwhile, the Starboard 6 power truss payload that Discovery will launch to the international space station will make its own trip to pad 39A this evening. Enclosed in the payload transport canister, the truss will be inserted into the pad gantry's cleanroom to await the shuttle's arrival in a few days. Space shuttle Discovery has been firmly bolted to the external fuel tank that will feed liquid hydrogen and liquid oxygen to the main engines during the eight-and-a-half minute ascent to orbit. Underway today is the connection of fuel, power and data umbilicals to Discovery from the mobile launch platform. After Discovery rode into the Vehicle Assembly Building on Wednesday afternoon, ground crews quickly got to work lifting the spaceplane vertically and positioned for attachment to the external fuel tank. In the center aisle of the VAB, the workers spent a few hours hooking up the large yellow sling to the orbiter. With that overhead crane connected, the shuttle was hoisted off the transporter a little after 11 p.m. EST. About an hour later, the shuttle was turned upright with its nose pointed toward the ceiling. At about 6 a.m. this morning, Discovery began its ascent high into the assembly building and then over into High Bay 3 where the external tank and solid rocket boosters stand stacked aboard the mobile launch platform. By 9 a.m. Discovery had been gently lowered in front of the fuel tank and technicians were getting the orbiter lined up with the mounting points. Initial connections should be completed this afternoon. NASA is targeting the start of Discovery's rollout to launch pad 39A for next Wednesday at 4 a.m. EST. A gallery of pictures showing this afternoon's move of Discovery can be seen here. IN THE VAB! Space shuttle Discovery has rolled to a stop inside the cavernous Vehicle Assembly Building where the ship will be mated to its external fuel tank and twin solid rocket boosters over the next few days. A metal "sling" is standing by to grab ahold of Discovery later today, lifting the shuttle from the transport hauler that carried it from the hangar during the past hour. A heavy-duty crane will rotate the spacecraft vertically, then begin the methodical process of hoisting the ship high into the rafters, over to the assembly bay and carefully lowering Discovery into position next to the awaiting fuel tank for attachment. Once the completed vehicle is fully mated together, the comprehensive Shuttle Interface Test to check the electrical and mechanical connections between the orbiter, tank and boosters will occur this weekend. This particular tank and booster set was assembled last summer for shuttle Atlantis' mission to service the Hubble Space Telescope. Atlantis was attached and rolled to the pad for a planned October blastoff. But technical troubles with the telescope have postponed the mission to May, prompting NASA to return Atlantis its hangar for the extended delay. The shuttle was rolled back to the VAB on October 20 and Atlantis was demated on November 11. That left this hardware assembled and ready for Discovery to use now. Rollout of Discovery to pad 39A is targeted for next Wednesday, January 14. Discovery will launch the $300 million Starboard 6 solar array truss, the fourth and final power module for the international space station. The 15.5-ton girder will be connected to the station's backbone by spacewalking astronauts during the mission. Led by commander Lee Archambault, the Discovery crew includes pilot Tony Antonelli, mission specialists Joe Acaba, Steve Swanson, Ricky Arnold, John Phillips and station-bound astronaut Koichi Wakata who will remain in orbit to replace Expedition flight engineer Sandy Magnus. She will return to Earth on Discovery after more than three-and-a-half months living on the station. Check back in a little while for photos of this afternoon's move. Discovery is completely outside the hangar now, slowly moving tail-first from its space-age garage under gray but dry skies. MOVE BEGINS. Space shuttle Discovery is leaving the hangar it has called home for the past seven months. The spacecraft is riding aboard a special carrier vehicle, balanced atop two attach fixtures in the aft and one under its nose. Preparations for the upcoming mission began when Discovery landed at Kennedy Space Center on June 14 to conclude the STS-124 flight that delivered the Japanese science laboratory module Kibo to the space station. The shuttle was towed from the runway to Orbiter Processing Facility bay 3, as the pre-flight campaign for STS-119 commenced with post-mission deservicing work, safing the shuttle systems, offloading residual fuels and removing the main engines. Through the summer the ship underwent extensive but routine testing and the standard preparations for its 36th trip to space. A new set of main engines was installed in September, the astronauts visited in mid-November for a close-up look at their ship and by early December the payload bay doors were closed as workers finished buttoning up the orbiter for a quiescent period over the holidays. This week the final weighing and center of gravity determination checks were performed. Those are among the last activities before mounting of the shuttle atop the 76-wheel transporter that hauls orbiters from their hangars to the Vehicle Assembly Building. A bit of unexpected work to remove and replace the shuttle's left main landing gear outboard tire was ordered yesterday due to low pressure readings. After Discovery reaches the center aisle of the VAB, cranes will be connected later tonight to turn the 100-ton spaceplane upright and hoist it into the nearby bay where the external fuel tank and twin solid rocket boosters await. The transporter's engine just cranked up. First motion of the shuttle's move should occur shortly. Good afternoon from just outside the Orbiter Processing Facility bay No. 3 where the hangar doors are open and space center employees are beginning to gather to see shuttle Discovery emerge. Mounted atop a special transporter, the shuttle will back out of the hangar for the short ride over to the Vehicle Assembly Building. The trip should take about 45 minutes. And now a positive sign that Discovery could soon be on its way to the VAB -- the hangar's sliding doors are being opened right now. The news media will be heading over there shortly to cover the first step toward Discovery's voyage to space. The rain has stopped already following the passage by that band of weather. Some pictures taken over the past hour from the Kennedy Space Center press site can be seen here. Under dark, menacing skies, the rain is beginning to pour here at the Kennedy Space Center press site. But the radar still shows this line of weather is very narrow and should race across the Cape quite quickly. Shuttle managers are expected to receive a weather update around 1:30 p.m. EST to determine when conditions could permit Discovery's safe transit from the hangar to the Vehicle Assembly Building. A NASA spokesman says the possible concern with cabling touching the right landing gear door has been put to rest and Discovery is poised to leave the hangar this afternoon, once the weather permits. An issue that has been under engineering discussion this morning is some cabling that workers noted could be touching the right landing gear door and whether the gear needs to be redeployed for further inspections. It is not yet raining here at KSC. But the radar shows the fast-moving weather is almost here and should pass through pretty quickly. The latest estimation for Discovery's roll is sometime after 1 p.m. EST. However, the local weather conditions associated with an approaching line of rain is now the driving force on the schedule. That band of rain, albeit rather narrow, is rapidly closing in. While Discovery remains inside its hangar, a key milestone is being completed in the Space Station Processing Facility this morning. The SSPF's overhead crane has carried the massive Starboard 6 truss element nearly the full distance across the building, going from a workstand in one corner to the transportation canister in the far opposite corner. The truss will be anchored into the canister, which mimics the shuttle's payload bay, for the trip out to launch pad 39A. As darkening clouds gather on the northwestern horizon, radar is showing the leading edge of that rain is about 40 miles away. The latest estimate is perhaps 12:30 p.m., but that will depend on completing the final paperwork and beating the approaching weather. Otherwise, the move could slip to much later in the day. Weather at Kennedy Space Center still looks good right now. But a line of rain associated with an approaching weather front is about 60 miles away and closing in. At this point, there is no firm time for Discovery's move. The space shuttle remains inside its hangar with the doors closed as workers continue marching through the checklists. We'll update as information becomes available. NASA says now it's looking like a 10 a.m. EST first motion of the shuttle. Technicians are trying to catch up after a bit of unexpected work was ordered yesterday to remove and replace the shuttle's left main landing gear outboard tire due to low pressure readings. The removal and replacement of the tire has been completed, and last-minute preps for transferring the shuttle to the VAB are being finished this morning. Meanwhile in the Space Station Processing Facility a few miles down the road, workers there are getting ready to hoist the Starboard 6 power truss into the transportation canister that will haul the payload to launch pad 39A. The truss will go into the can later today, then be moved to the rotation facility to be turned vertically and eventually driven out to the pad on Sunday for installation into the clean room of the gantry to await Discovery's arrival next week. Discovery's trek to the Vehicle Assembly Building is now targeted to get underway around 9 a.m. EST today. Technicians are finishing up work to prepare for the shuttle's quarter-mile move. The first visible sign that a shuttle launch is nearing occurs when the orbiter moves from its hangar to the Vehicle Assembly Building for attachment to the external fuel tank and twin solid rockets. Shuttle Discovery will make that trip Wednesday morning in preparation for its mid-February blastoff. NASA now projects that Discovery will begin departing the hangar no earlier than 8:00 a.m. EST. We'll update this page as the morning unfolds. After a quiet break for the holidays, Kennedy Space Center technicians are back at work preparing Discovery for the first space shuttle launch of 2009. The spacecraft will leave its hangar early Wednesday for a week-long stay nearby in the landmark Vehicle Assembly Building where the orbiter will be hoisted vertically and attached to the waiting external fuel tank and solid rockets. Rollout to launch pad 39A is scheduled for January 14. Discovery is being readied to truck into orbit the final segment of the international space station's truss backbone. With 10 pieces already installed on the outpost, the upcoming construction mission will deliver the far starboard truss and then unfurl a pair of giant power-generating solar arrays that stretch 240 feet tip-to-tip. Carrying a crew of seven astronauts and the 31,127-pound truss payload, Discovery is scheduled for blastoff at 7:32 a.m. EST on February 12. Commander Lee Archambault will lead the flight. He'll be joined by pilot Tony Antonelli and mission specialists Joe Acaba, Steve Swanson, Ricky Arnold, John Phillips and station-bound astronaut Koichi Wakata. The veteran Japanese flier will replace Sandy Magnus as a member of the station's Expedition 18 resident crew. Magnus returns to Earth aboard Discovery to complete her three-and-a-half month flight. The first leg of Discovery's voyage occurs with Wednesday's quarter-mile trip from the Orbiter Processing Facility bay 3 hangar to the Vehicle Assembly Building. That move is expected to begin around 6:30 a.m. EST. Our Spaceflight Now Plus subscribers can watch stunning high definition video of Endeavour's countdown and launch. Become a subscriber today and experience the space program like never before. The official embroidered patch and lapel pin for the International Space Station Expedition 18 crew is now available to from our stores. The official embroidered mission patch for STS-125 is available for immediate shipment from our store. The final servicing flight to Hubble is now scheduled for spring 2009.